Jesus said, “My sheep hear my voice,” but many Christians do not know how to hear from God. In this practical, story-rich guidebook, international teacher Larry Kreider shows believers how to develop a listening relationship with the Lord. 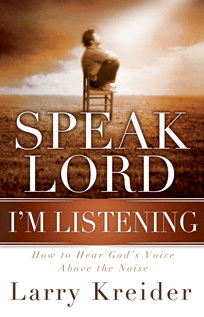 Speak Lord, I’m Listening explores the multiple ways Christians can hear the voice of God in today’s world. It offers real-life examples-not theory-of how God teaches His followers to listen, with tips in each chapter for distinguishing His voice from the noise of Satan’s interference. Christians across the denominational spectrum will develop a closer and deeper relationship with God as they learn 50 unique ways to listen to Him. You will realize that God was speaking to you all along but, like the disciples on the road to Emmaus, you didn’t know it was Him! Brings together the 50 unique ways Christians in various cultures and denominations hear God’s voice.